I believe poetry is the study of language. Unlike spoken language, it is a language of the heart, not visible from the surface. It is the filling of the air with words selected out of deep contemplation. Not a gathering of the meanings of words spoken to be spoken, but an attempt to say something, or to reflect something. Very sparse and most strict, it is a skillfulness right on the brink of burning out like a flame. - "When Passing Between Trees"
Sagawa Chika was born in 1911 in Yoichi, Hokkaido in Japan and lived a short life, dying of stomach cancer in 1936. Although she was sickly nearly her entire life, the poems she left behind are brilliant and bold. They are vibrant with color and imagination. 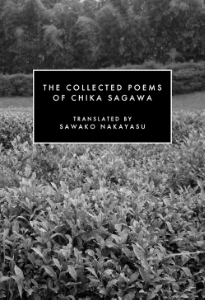 Her Collected Poems, translated by Sawako Nakayasu, is a testament to Chika's genius. The translations feel fresh and could easily pass as contemporary work. In the prose piece "Had They Been the Eyes of Fish," Chika observes, "Perhaps the way poetry finds expression is by taking materials that had once been reflected in reality and returning them to the realm of thought." When these "materials" are returned to thought, they do not always retain the constraints of reality. There is perhaps a hint of linearity in "One Other Thing," but the way each element is presented is surprising. One would not expect the poet to move from the asparagus diving into the sunset to the blue blood in the window before ending with "the sound of a fern unfurling." The earlier images evoke a kind of chaos, while the final image represents a very slow, deliberate order. Hit by a heavy weight, insects descend the tree shade. killed by the sun, the waves. My skeleton places white flowers upon it. Interrupted by thoughts, fish climb the cliff. At first glimpse, "Rains like flower petals" is a simple, if not overwrought simile. The line would normally kill a poem, and yet in the broader context, the line fulfills the function of a surreal image rather than mere simile. If "Afternoon" were to be represented on canvas, perhaps the resulting artwork would be similar to a Salvador Dali painting. Meaning in her poems is often allusive. Wallace Stevens observes in "Adagia," "A poem need not have meaning and like most things in nature often does not have." A reader intent on extracting meaning from Chika's poems will likely come up empty-handed. This is not to say her poetry is meaningless, but rather it is poetry better experienced rather than understood, although the experience of the poem, on its own terms, is itself a sort of understanding. I have a bit of a fever, my back hurts and I cannot stand up. I eat apples and pears. In the afternoon I chat in quite a loud voice. One might only speculate what Chika could have accomplished had she lived a longer life. As stunning and impressive as her writing is, it is the work of a young poet brimming with potential but not fully reaching it. And yet ironically, had Chika lived to old age and had these poems been summation her life's work, they would be enough.